Librarian Karen Maheux has only a few more days behind the desk and stacks at the the Palisade Branch Library. She is retiring on April 4th. Photo by Bill Hoffmann and story by Brenda Evers and Karen Maheux. Maybe eight years is enough. 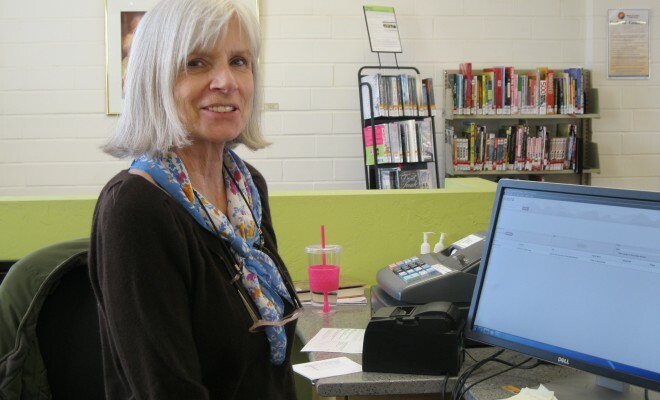 In August of 2007 Karen Meheux, started her career at the Palisade Branch of the Mesa County Libraries. Her main goal was to create a sense of community at the library. In other words, she created programs and events that made the library become a vibrant, vital center for all. Maheux came to Palisade from Laramie, Wyoming. After 30 years the wind, the cold, and the snow, finally got to her. So she loaded up her vehicle and did some pre-move research on the Web. Grand Junction seemed to be a good fit for a person from Laramie. So she took the leap and rented an apartment over the Internet. On January 7, 2006, she was signing her lease when she asked where her rental might be. “Down the road twelve miles east,” they said. And there you have it — a mistake which will make perfect sense for her. Karen’s first employment in the valley was for Chris Millensted, the owner of Tucan Coffee. She managed the coffee shop for him and enjoyed brainstorming with Chris on the future of the shop. Unfortunately Millensted’s life ended in a vehicle accident the next year. She wanted to stay in the Palisade area; thus, she was looking for another career opportunity. The same year that she became library manager she took a position on the Palisade Planning Commission. She found them both challenging, but the Palisade branch was her main achievement. She promoted the Tuesday Morning Knitting Club at 9:30 am, followed by the 10 am Story Time with “Mrs. Rogers,” Mary Fay, and other volunteers who love to read to the pre-schoolers. Karen the Librarian also encouraged local adults to start the Palisade Writers Group, which has been quite successful in self-publishing and growing in number. They still meet on the second and fourth Friday at the Palisade Library. Other events have happened at the library, after hours or during the festivals: photography contests, speakers about the arts, business, folklore, etc., anything the community wanted to hear or do. The library has grown to encompass whatever the townspeople want to enjoy. There have been Spanish lessons for adults on Saturdays, “meet and greet” local authors presentations, and more, something for readers of all ages. Karen connected the community of Palisade. Other organizations such as the Palisade Auxiliary (the Palisade friends group which runs the used book store out back), the Palisade Chamber of Commerce, the Town of Palisade, and the Palisade Historical Society found Karen and the library a welcoming center to gather people together. She took great joy in seeing individual friendships form at the Library. “The community has filled my heart, and I am thankful,” She said. Not to worry, Karen is not moving away from Palisade. She will be a part of the community. After the first week of April she will be spotted riding or walking and still stopping by to check out some books at the Palisade Branch Library. Eight years of her hard work have gone by fast, but she has decided that it is time to retire. ← Previous Story Palisade Library Auxiliary sponsors author readings on Saturday, March 14, 2 to 4 p.m.
Karen, we are so happy for you! We both have retired within the last month, and highly recommend it! Enjoy and throw away your alarm clock. Relax. So glad you finally got there. Maybe we can finally get that coffee or luncheon together on Saturday morning now that they will be free. Congratulations and thanks for all of your hard work with the library! Karen you’re the best! Thanks for all you help, and look forward to seeing you in our writing group!